I wrote this up to give you some of my few tips on how to avoid being tricked when buying a second hand iPhone and similar Apple devices! Too think, compare to other mobile devices - iPhone is one of the most difficult to check when it comes to identifying whether the device is in good condition, is it already factory unlock, and is it already unlink to a certain iCloud account? This year, there are countless Apple users that are been trapped on iCloud activation. Once the Apple devices are restored the next thing you will be facing on its screen is the activation process. It needs data or much better - a WiFi connection. Well, the thing is… it requires an Apple ID associated with the iCloud before that iPhone/iPad/iPod was restored. However, it is not going to show up when Apple device was already remove on the previous iCloud account. I mean, activation of iOS devices is just a few taps away to its main screen and you can use the phone after that. 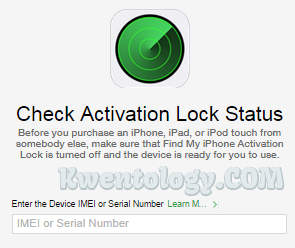 Anyway, Activation Lock works only with iPhone, iPad, or iPod touch devices using iOS 7 and above. Why Apple Make This Tough Security? To locate a lost or stolen device via Find My iPhone feature. Erasing things you put on that device such as personal messages, contacts, and even apps - everything. The last important one, to reactivate and use your device. If you do not know the credentials only one thing can happen when a device locked to iCloud. You can’t use the device no matter what. There’s an offer for Removal iCloud but the cost is nearly the price you bought the device. If you do not have infos of the iCloud account on the device you purchased recently. Then admit it… there’s in no other way. How To Get Rid of iCloud Lock iOS Devices? OK, so now you want to buy an iPhone. Follow these methods to get rid of that Activation Lock that may occur when you attempted to restore or update the iOS version. Let's get into the iPhone screen first. Open the Settings, go to General and tap on About. Get the IMEI or Serial Number. Go to iCloud using a browser; see the box for the link of Check Activation Lock status. Click on continue and wait for the result. When Find My iPhone Activation Lock is on or active. The person should first remove the device from his/her iCloud account. So, the new user can fully operate the iOS device without worrying about the iCloud Activation Lock for the next time. Remember, before you purchase an iPhone, iPad, or iPod touch from somebody else, make sure that Find My iPhone Activation Lock is turned off and the device is ready for you to use. Thank you for reading Tips When Buying a Second Hand iPhone, iPad, iPod Touch to Avoid Getting Into iCloud Activation Lock posted on the website Kwentology if you want to redistribute this article please include the link as the source. Have some kuwento to share? Contact us!